Everyone who knows me knows that my favorite sweetener is brown rice syrup. But recently I made a cake for my parents’ fiftieth wedding anniversary, which would serve many people who eat the average American diet. I was very concerned that everyone like the cake, so I made three attempts in order to perfect the recipe. I wanted it to be moist, light, sweet enough for the crowd, and delicious. 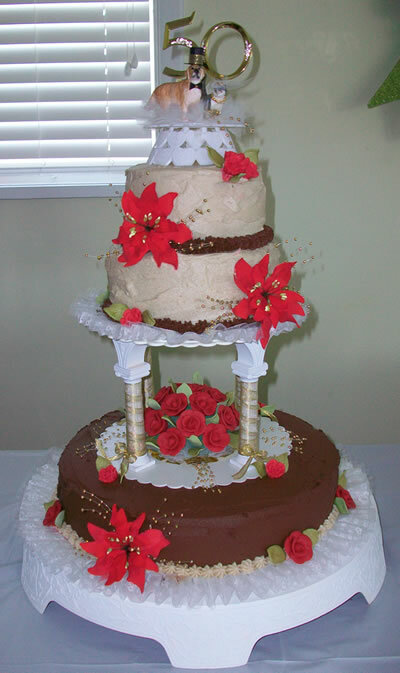 I believe I achieved all those things – my family said it was the best cake I had ever made and I received compliments from the rest of the guests as well! To make the cake sweet enough for everyone without using refined processed sweeteners that my health-conscious guests would not eat, I used Sucanat. It’s a dehydrated, granular, brown, all-natural sweetener found in most health food stores. It’s made by pressing the juice from natural cane sugar and cooking it down to a thick syrup. The syrup is then dehydrated and ground into sweet small pits. All the nutrition from sugarcane remains in Sucanat. I originally wanted to create a vanilla cake, but using Sucanat turns the cake a light brown color with a rich maple, almost molasses-like taste to it. To create additional moisture, I used apple sauce. I made my own by simply cooking down some chopped up organic apples. You can also use store-bought apple sauce. I chose spelt flour because it does not have the distinct taste whole wheat flour has. Spelt is also light and does not create a dry cake. For the frosting, I used maple syrup and amazake for sweeteners. Amazake is made from brown rice. You can find it n the freezer section of health food stores. For your next special event, here is one of my best recipes! Blend the flax seed meal and rice milk in a blender or food processor for about a minute until it looks frothy. Add the remaining wet ingredients. Blend until smooth. Sift the baking powder and flour into a bowl. (Sifting creates a lighter cake.) Now mix together the wet ingredients with the dry. Pour into oiled 9” cake pan. Bake at 350 for 35 minutes. Let cool completely before frosting. In a sauce pan, heat the rice milk, amazake, agar flakes, and sea salt. Let simmer 10 minutes. Whisk in the kudzu mixture. It will thicken as it cooks. Once thickened, remove from heat and place in refrigerator a couple of hours until completely cold. Put in food processor along with cold Earth Balance. Blend until smooth. Add the rice milk slowly while it blends to create the desired consistency. Be very careful not to add too much or the frosting will become runny. Frost cake. Valerie Wilson is the author of Perceptions in Healthy Cooking. She teaches cooking classes and offers counseling in Westland, Michigan. She can be reached at (734) 722-4553 or http://www.macroval.com.